The Grosvenor Casino in Southampton - just a stone's throw away from the English canal - is a friendly and exciting casino venue located close to one of the most famous harbour areas in the United Kingdom. This is a modern casino that is dedicated to offering the best in terms of service and games for gamblers of all ages (over 18, of course). Southampton - as an old industrial city - has developed massively in the last few decades and this can be seen clearly when we look at where the casino is located. The Leisure World shopping and entertainment centre holds this casino, a prime location to enjoy gambling, shopping and games all in one. By offering a nice selection of games and amenities the casino keeps up with the general notion that Grosvenor casinos are some of the best places to go and gamble. Opening hours are just what you would expect from a Grosvenor casino - the casino is open 24 hours a day, seven days a week, making it an ideal location for gamblers, diners and drinkers to go and enjoy a good day or night out. It is worth pointing out that the casino restaurant is closed on Sunday, Monday and Tuesday. The gambling floor at the Grosvenor Southampton Casino is not the most comprehensive one that we have visited lately but thankfully it covers all the basic casino games. Gamblers will find numerous tables that offer American Roulette and Blackjack. Alongside this the casino offers a decent amount of electronic gambling machines, including slots and electronic roulette. Two of the most popular slot games available are Lucky Lady's Charm and the Cleopatra slot game. The layout of the gambling floor is on that is similar to most other Grosvenor casinos, with the tables being right at the heart of the room and slots flanking the walls to maximize the amount of space for gamblers. One of the things that we really enjoy about this casino is its dedicated Poker section. A new casino cash game starts every day at 18:00 and then runs for a full 24 hours until a new game starts again. There is a huge amount of Poker tournaments on a regular basis but we will cover those further down in the review. The Grosvenor Casino in Southampton has a restaurant which is called the Grosvenor Grill - a name that should be familiar to anyone who has ever visited a Grosvenor casino before. By this name alone it is quite easy to guess what type of food is on offer for gamblers. Sirloin steak, rib eye steak and fillet stake are used handsomely to create some of the best grilled dishes that you will find south of London. One of the nicer features of the restaurant is the other grilled dishes on offer - including grilled Sea Bass, Salmon and Pork. These dishes are complimented by a few curries, and vegetarian dishes to make it a very comprehensive menu. The best way to stay up to date with what is going on at this Grosvenor casino is to visit their website on a regular basis. 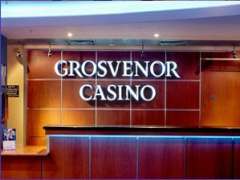 Grosvenor casinos around the UK are quite famous for offering a good selection of promotions and events to entertain gamblers. One of the constantly ongoing promotions that they offer is "More the merrier" - an event where you can introduce a friend to the fun family of Grosvenor and get a free drink from the casino bar. The Midweek Madness is a food promotion where you get two courses for just £9.95 as well as £10 in VIP chips to gamble at the casino. The Roulotto promotion is also ongoing - where you can play every mid-day on the numbers that will appear on a particular roulette wheel. One number will win £5, two numbers will win £10 and getting three numbers right could give you the jackpot of £250. The Psychic night is another event that we are quite looking forward to. Join the casino for dinner and a reading from one of their special guest mediums for a spooky night out in Southampton. We have visited few casinos on the south coast that dedicates so much time and effort in to making the casino experience special and unique. The huge amount of events taking place on a weekly basis is a great selling point for locals and visiting tourists alike. The Grosvenor Casino in Southampton is a casino that offers a good selection of the most basic things a gambler wants. The food and drinks are a great addition and allows gamblers to make a full night out of visiting the casino. With such a nice location - close to the water - this casino can also boast an almost unrivalled amount of activities around it. Being located in the Leisure World centre there are so many things that you can send friends or family to do while you nip of to play a few hands of your favourite game. Grosvenor are famous for offering a great night out but few nights are better than the ones at the Grosvenor Casino in Southampton.